El Puente’s Espiritu Tierra Community Garden is proving that community gardens are great incubators for the sustainable neighborhoods movement. This year, part of GreenBridge’s Community Garden Alliance outreach focus was on rain gardening. That, paired with rain collection efforts at Espiritu Tierra, resulted in several rain gardening workshops there this past spring and summer. These hands-on workshops detailed the benefits of rain gardens and offered guidelines for creating individualized garden plans. Rain gardens are shallow depressions designed to soak up water and support plants that tolerate both wet and dry conditions. By absorbing precipitation, they help reduce the stormwater runoff that pollutes our beaches and rivers. Often located near gutter downspouts or places where water puddles, rain gardens can be landscaped into gentle slopes or run curbside along streets. Easy to install and requiring little maintenance, rain gardens are attractive year-round and also support local wildlife. Through these workshops, GreenBridge was delighted to participate in Williamsburg’s Green Light District, an ambitious ten-year initiative conceived by the community human rights institution El Puente and carried out in partnership with several other community organizations. The goal is to transform this environmentally challenged neighborhood into one with a healthier streetscape, a smaller carbon footprint, and a more sustainable community. A school rain garden sounds like a terrific idea—besides being beautiful, they teach so many important lessons! NYC’s School Garden Initiative, Grow to Learn, might love to fund such a project. Is this something that a school gardening committee can work on? Is there perhaps a grant I can apply for for this to happen? Is there someone that I could speak to regarding rain gardens and maybe someone willing to come to my school to help promote this idea? 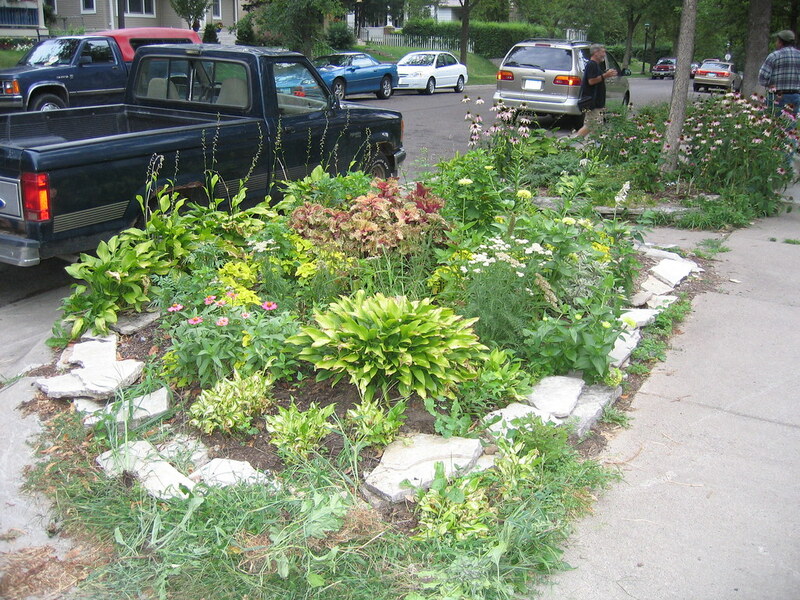 A rain garden flourishes in Minneapolis. Photo by Robin Simmen.